With a foreword by Ree Drummond, this beautiful book has 100 easier, faster, lightened-up Southern recipes, from the blogger behind the popular Add a Pinch website. A generation ago, home cooks may have had all day to prepare dinner, but most folks now want convenient, fast recipes that don’t rely on canned soups or other processed products. Here, fresh ingredients take center stage in slow cooker meals, casseroles and one-dish suppers, salads, soups, and desserts that have deep, satisfying flavors but are a cinch to make. Smart swaps like Greek yogurt for mayo in pimento cheese and cauliflower “rice” put a modern spin on these dishes. With 75 color photographs and lots of sidebars, this is the new Southern cooking handbook. 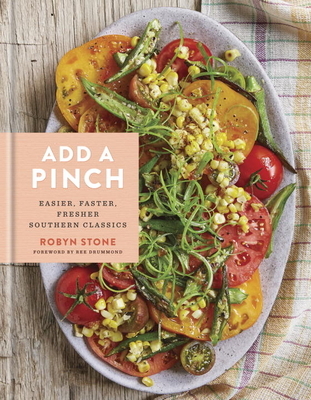 ROBYN STONE is the creator of the Add a Pinch blog, which has been featured in Southern Living, Better Homes and Gardens, Redbook, and online at the Huffington Post and Food Network. She lives in Georgia with her husband, Bart, their son, Sam, and their two golden retrievers, Ranger and Annabelle.